(Rapid Lake, Quebec) Today, the Algonquins of Barriere Lake are re-affirming their opposition to the proposed exploration activities of the junior mining company Copper One (TSX-V: CUO) within their unceded traditional territory. Copper One’s Rivière Doré project is within the area of an existing co-management agreement that Barriere Lake signed with Quebec and Canada in 1991 (the Trilateral Agreement). The Trilateral Agreement was negotiated in a spirit of coexistence with Quebec and Canada in order to share the responsibility and benefits of sustainably managing a portion of the Algonquins of Barriere Lake’s traditional territory. Mining was not a consideration in the agreement and there has not been a process established by which claim staking, mineral exploration or mining could be considered within our territory. Despite a well-established body of case law (for example the recent decisions in Ross River Dena Council and Wahgoshig First Nation) the Quebec government has not fulfilled its duty to consult, accommodate and seek our consent for claim staking or mineral exploration. In the last decade, both Canada and Quebec have failed to uphold the spirit and letter of the Trilateral agreement. As a result the people of Barriere Lake have been forced to spend considerable resources and put themselves at risk of harm and legal retribution defending their land. The government owes the community the duty to consult and obtain the consent of Barriere Lake prior to any mineral exploration. As the duty rests with the government of Quebec, the community sees no reason to negotiate with Copper One, a private party that established an interest in Barriere Lake’s territory without consent. On January 16, Barriere Lake wrote letters to the provincial Ministers of Aboriginal Affairs and Natural Resources regarding the community’s concerns. To date the ministers have failed to respond. The Algonquins of Barriere Lake are calling on Copper One and other companies with claims in their territory to cease activities on their projects and allow the claims to lapse. In addition to Copper One, the companies with claims in the Trilateral Agreement area include Cenit, Mundiregina, Forest Gate Energy, Mines Virginia and the Quebec government-owned corporation SOQUEM. 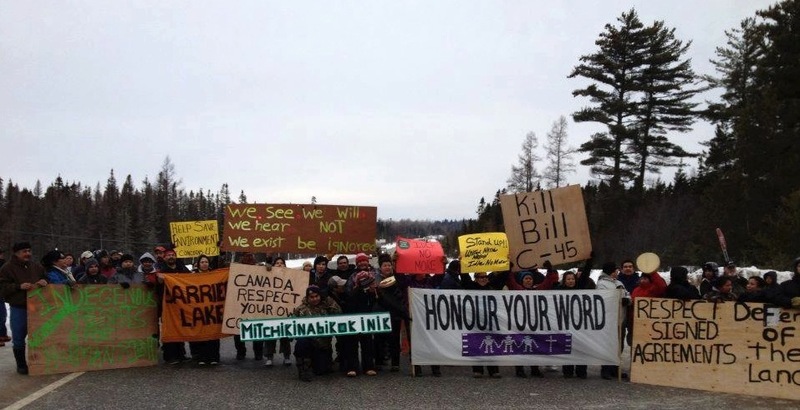 Barriere Lake are insisting that their traditional territory be withdrawn from staking by the Quebec government – as the Ontario Government removed much of the territory of Oji-Cree community Kitchenuhmaykoosib Inninuwug in March 2012.